Check out 5 fun and interesting bun hairstyles for Karwa Chauth’s ultimate glam look! I just love the festivity that goes around Karwa Chauth. Women folk dressed up in their finest clothes and jewelry, mehndi clad hands, jingling of bangles, with all the 16 shringars of a married woman. But what about hair? This aspect of your look often gets neglected. Most of us end up blow drying our hair and leaving them open or maybe half tying them. Now that sounds really boring. So why not try some bun hairstyles this Karwa Chauth, that are really simple to do and will give you a graceful and elegant look. 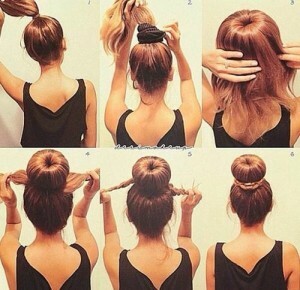 So let’s take a look that some of these buns that have been simplified step by step for your ease. 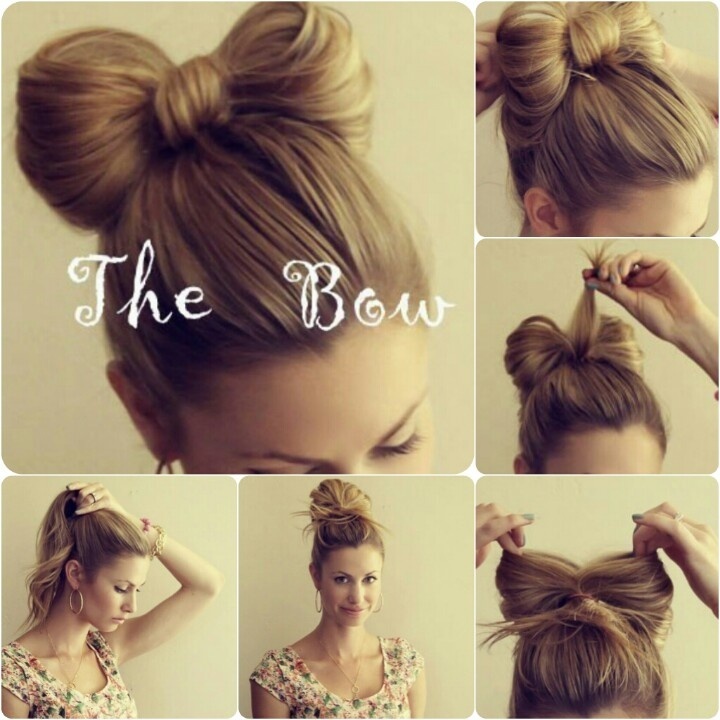 Looking for something girlie and fun for your hair, then the bow bun is for you. This ones a cute, flirty, feminine hairstyle wherein your hair is styled in a bun that resembles a bow. So let’s get started. Tie all your hair with a rubber band, rolling them up high into a high bun, leaving the hair tips hanging loosely through the rubber band. 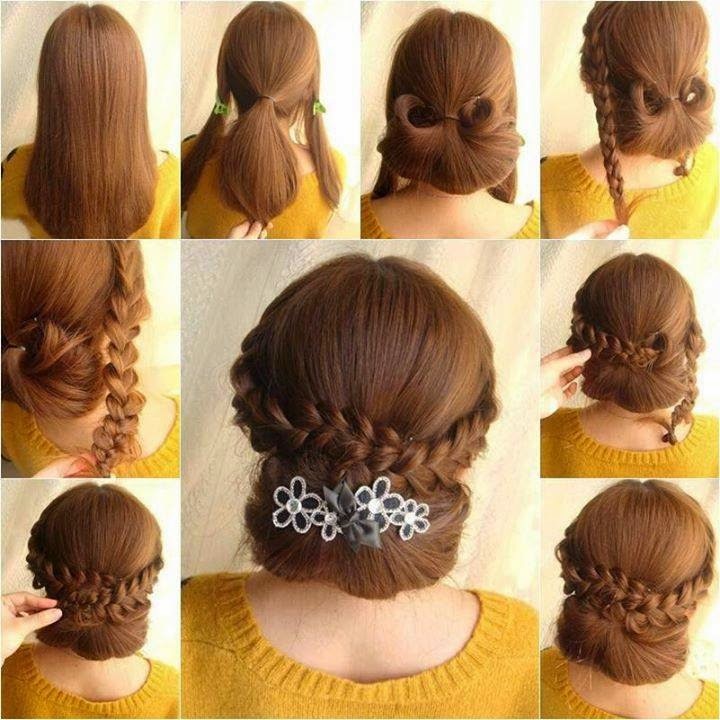 Now this one is a really interesting take on our traditional French braid. Try it out for a chic, sophisticated look. Start French braiding your hair, through the center, beginning right from the forehead, all the way down until your neck. 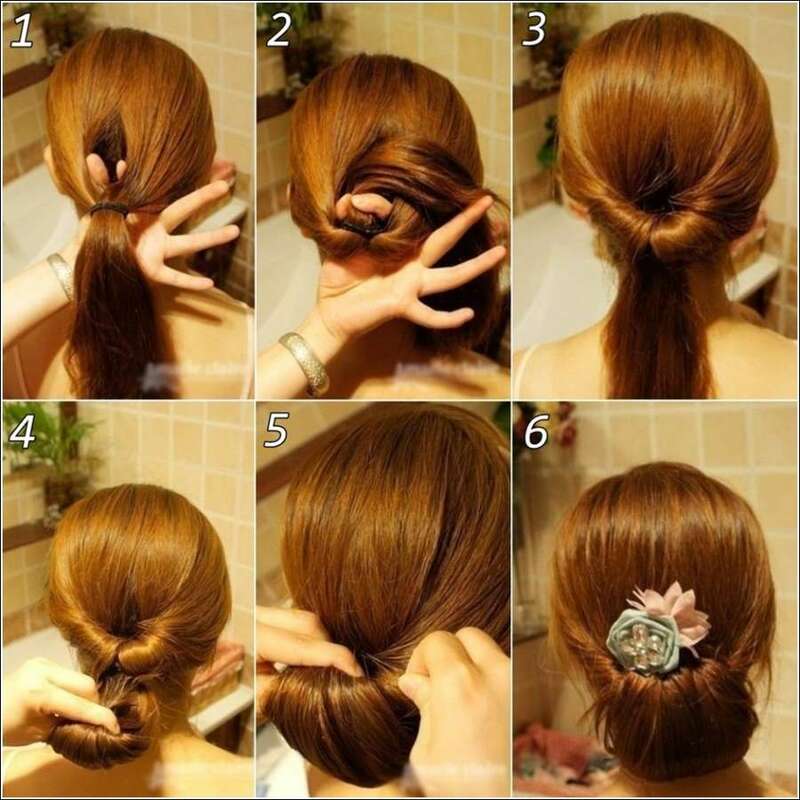 Next loosely tie the rest of your hair into a pony tail. Now pick up strands of hair one by one and curl them up with a curling tong making small rolls with the strands. Secure these rolls at the back of your head with the help of pins and voila, you’re ready with your French braided messy bun. Try out this really simple yet elegant bun this Karwa Chauth. It’s neat, classy and very easy to do. So begin with twisting the fringe section of your hair from both the sides, twisting them all the way till the back. Secure it together with bobby pins. Next up, pull all your hair back and tie it down into a ponytail with a rubber band. Now pick up the pony tail, upside down, making it pass through the upper section of your hair. Now start rolling up your pony tail, until it reaches your nape. Secure it together with bobby pins into a low bun at your nape. And don’t forget to accessorize. Now this is another variation to the above rolled up bun. Start by tying your hair into a low ponytail, leaving aside the front sections of hair on both the sides. Next, roll up the ponytail and secure it at the nape with pins. Now start braiding the front sections of hair, all the way up-til the tip of the hair. Bring both the braids back and pin them up neatly crossing each other on top of the rolled up bun. 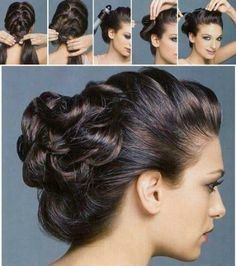 Accessorizing the bun would glam up the whole look while hiding any unruly, untidy hair ends that might show up. This is another high bun that’s neat, classy and elegant and the finished bun resembles a doughnut and hence the name. It is really popular on the red carpet and most Hollywood divas swear by it. Start by tying all your hair neatly into a high pony tail with a rubber band. Top it up with a voluminous scrunchie. Now wrap all your hair around the scrunchies making a hole right in the center of the bun securing it with another rubber band. Now start braiding the hair that were left behind and neatly wrap the braids around the bun, hiding the second rubber band and you’re all set.